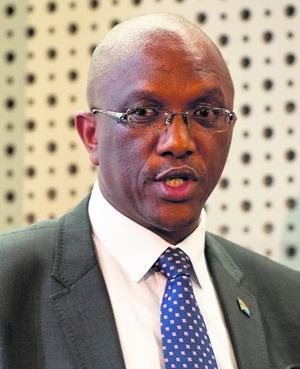 Cape Town - Auditor General Kimi Makwetu on Tuesday announced his office’s decision to terminate, with immediate effect, the government's auditing contracts with KPMG and Nkonki Inc. The two beleaguered companies had been doing public sector audits on behalf of the Auditor General of South Africa, the AG said in a statement. The AG uses various private audit firms – such as KPMG and Nkonki Inc - to conduct audits on its behalf and support its auditing staff. The contracted firms are obliged to "stringently follow" the AG’s auditing standards as well as the ethics that are the pillars of the accounting profession, it said. "Once these have been fundamentally impacted, we are called upon to review and reassess our position." Auditing firm KPMG has experienced a harrowing few days, following the resignation of two partners facing internal disciplinary charges and the announcement that it would review all the work done by its partners over the past 18 months in a bid to regain public trust. "What we are doing is basically opening ourselves up to scrutiny," said its CEO Nhlamulo Dlomu in Johannesburg on Sunday. KPMG’s audit of VBS Mutual Bank was the final straw for the AG. Makwetu had said in 2017 that he would wait for results of various investigations into the auditing company’s handling of Gupta accounts and a South African Revenue Service (SARS) report, before deciding whether to terminate its services. Makwetu said on Tuesday that recent media reports relating to the external audit of VBS Mutual Bank and the conduct of KPMG audit partners were among the reasons that prompted the decision to withdraw all KPMG audit mandates with immediate effect. On the termination of Nkonki Inc’s contract, Makwetu said media reports on matters arising from the shareholder transactions involving the firm were of "grave concern and pose significant risk on the reputation of my office through the statutory audits contracted" to Nkonki Inc. The decision to terminate Nkonki Inc’s contract follows the resignation of its CEO Mitesh Patel last week. Patel resigned after investigative journalism centre amaBhungane revealed that his R107m "management buyout" of the auditing firm was funded by Gupta associate Salim Essa. Makwetu said that as South Africa’s "supreme audit institution", the country looked to the office of the AG to "act and project an image of accountability, the same way we hold the entire public sector to account on how it uses taxpayers’ monies". "This is one of the tenets that have anchored this organisation for over 100 years, and we encourage all our employees and contracted audit firms to conduct themselves in a manner that will not erode this long-standing legacy," he said. However, he added that the termination of the contracts were not a "judgement on the capabilities or integrity of the professionals that work in the firms" but instead recognise the "significant reputational risks" that being associated with two firms could carry. KPMG saw an exodus of clients after at least 9 senior executives resigned over the auditing of Gupta-linked accounts and the partially withdrawn SARS 'rogue unit' report. The firm is now under renewed pressure with some of its largest customers, Barclays Africa, Nedbank and Standard bank reviewing the quality of work from KPMG before deciding whether to terminate their contracts. In September, former Finance Minister Malusi Gigaba advised all government departments and entities to review all work done by KPMG to ensure the audit processes have not been compromised. Meanwhile, Makwetu will be a panellist at a discussion on Wednesday about ethics in the accounting profession and its dented image, hosted by the South African Institute of Chartered Accountants (Saica) and Wits University.